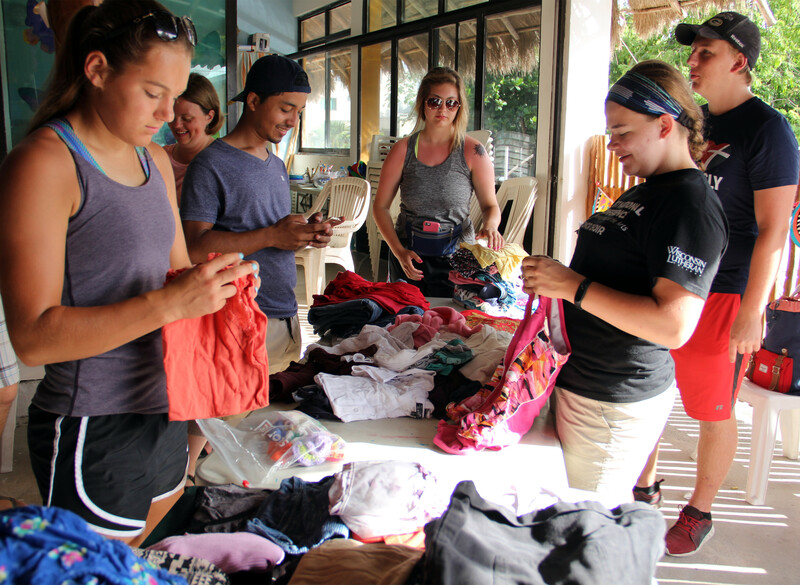 Mission Mahahual Part 2 – What are we doing here? “Give a man a fish and he’ll eat for a day. Teach a man to fish and he’ll eat for a lifetime.” Except that in Mahahual, everyone already knows how to fish, and many of them are tired of it. I heard a story while down there that some of the people who live on the beach eat so much lobster that they’ll gladly trade a bunch of them for a frozen chicken. 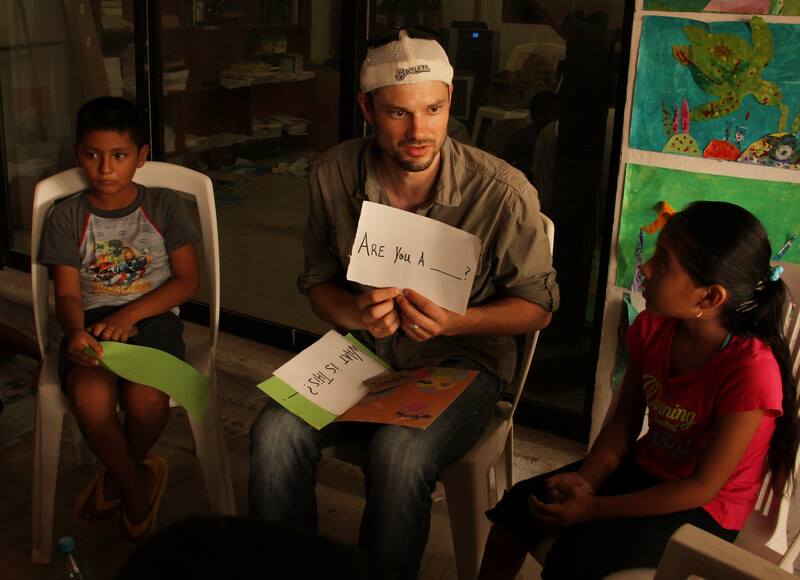 But one skill essential for improving a person’s situation in Mahahual is English. The main industry of the entire area is tourism, and for nine months out of the year there are cruise ships every day bringing in tourists. Many of these tourists speak English, either as their first language or their second. The best paying jobs in town are at the port, where the ability to communicate in English is almost a requirement. Because many people in Mahahual don’t speak English, the port brings in people from Belize and other larger Mexican cities to fill its 1,000+ positions. The next best jobs are those that put people in direct communication with tourists – restaurants, beach clubs, hotels, dive shops, and souvenir stands. Once again, speaking English is a leg up in getting these jobs. Many children in town, especially in the poorer parts of town, don’t even have access to regular schooling. And even if they are able to go to school, the schools in town do not do much in the way of English education. We saw this as an opportunity for the mission to connect with the community in a meaningful way. 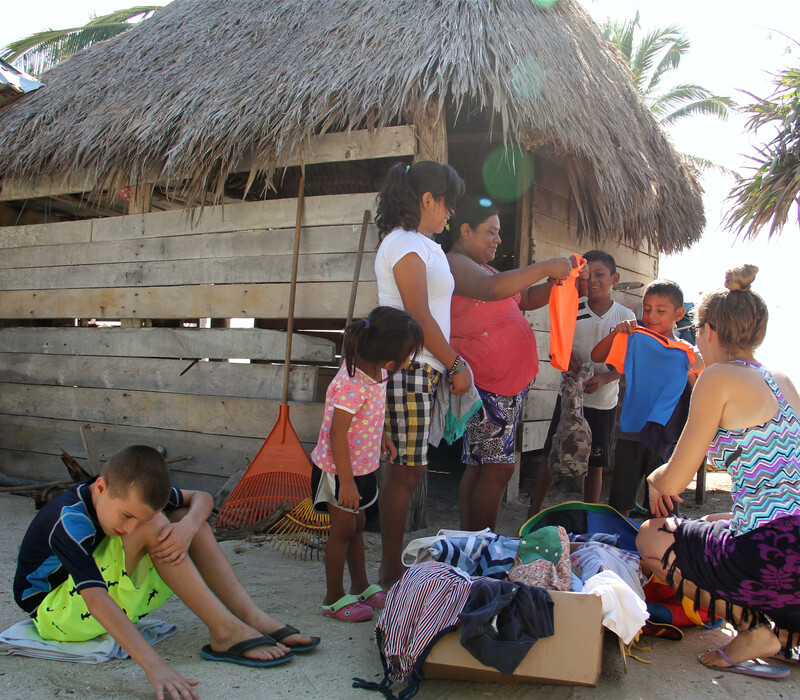 If we could help them develop English skills, they would have access to jobs that would not only give them a brighter future individually, but would keep more money in Mahahual and strengthen the overall economy. The goal of every mission is to share the Gospel of Jesus with people who need to hear it. But take for example Jesus’ response to the paralyzed man who was brought to him – yes, he gave him forgiveness and eternal hope, but he also gave him physical healing. Jesus did the same with countless others. We follow his call to meet both earthly and eternal needs. We pulled together a program where we would gather kids at the church every day of the week for four weeks and teach them Bible stories in Spanish and then teach them English skills. We recruited two awesome young women (shout out to Taylor Weber and Brittany Brassow!) as lead teachers, and organized teams to come down and provide support. As plans often do, this one morphed to include so much more than originally intended. There was an art camp, we worked with the local community center, we played soccer with kids, took them on a field trip to the port, helped clean up trash in the streets of the community, distributed clothing and hygiene supplies, and knocked out a painting project on part of the fence around the church. As of today, the team there this week is helping with clean up after Tropical Storm Franklin rolled through. No matter the work, our goal is to represent Christ in all we do. 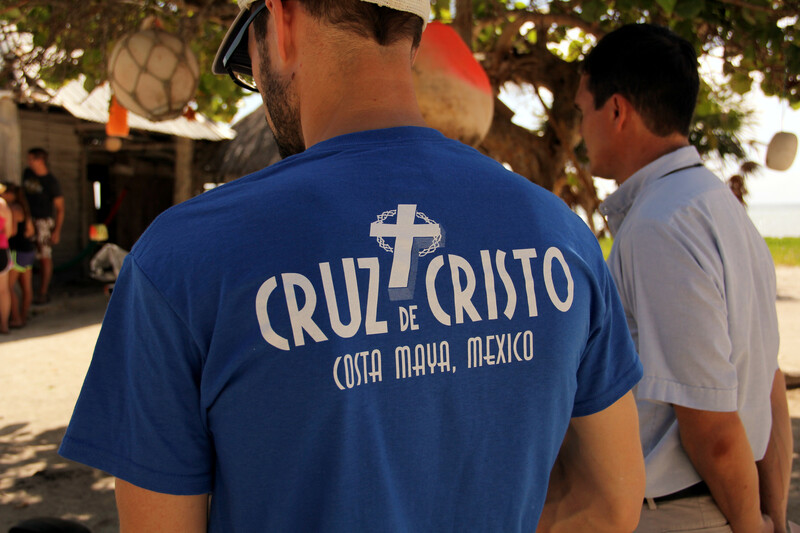 The name of the mission is Cruz de Cristo, in English, “Cross of Christ.” Whether we were picking up trash, or holding a kid’s hand walking through the port, or teaching kids English at the community center, we were putting in front of everyone we met those three simple words – Cross of Christ. A reminder that there is something bigger than all of us, bigger than our trials, bigger than our sins. A reminder that there is a love that is greater than anyone on this earth can ever show. The Costa Maya area is hungry for the Gospel. There is only one functioning Christian Church in an area populated by thousands – Cruz de Cristo. Costa Maya is just a small portion of the Yucatan Peninsula, an area larger and more populated than all of Wisconsin. Cruz de Cristo is the only Lutheran Church in the Yucatan Peninsula. Our church body, with its solid declaration of the Gospel in its truth and purity, has so much to offer a part of the world that is steeped in what I’ll call “superstitious Catholicism” – a belief system that is part Catholic doctrine, part Mayan tribal custom, and almost all works righteousness. Poverty, addiction, abuse, and illiteracy run rampant through this area, leaving significant human need in their wake. Along with the primary goal of making disciples, we also want to show the love of Christ to people in need by helping them with their human needs. We are blessed here in America with an abundance – let us reach out to those in need. 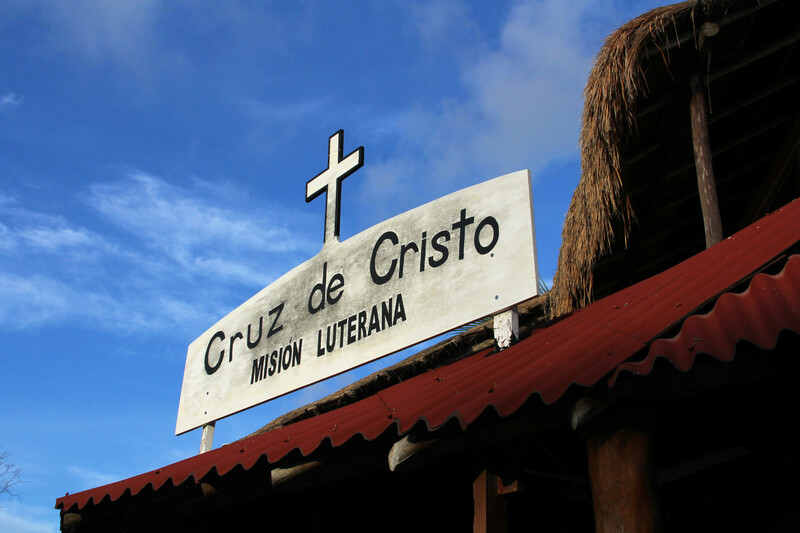 Cruz de Cristo is not funded by a World Mission Board or supported by a Synod. It grew up organically, and can only continue through the support of individuals and their congregations. Every time I have read this section I’ve been somewhat fascinated by the question of how exactly the Holy Spirit showed Paul and his companions that they were not to enter Bithynia. What obstacles did he throw in their way, and at what point did they finally conclude, “God doesn’t want us there right now”? I don’t have answers to these questions, and it’s probably good that God doesn’t give them, because then we’d be looking for signs far too specific. Instead we’re left with the simple understanding that sometimes God has a plan for our ministry and the spread of his Church, and whatever plans we might think make sense, he knows better and will guide us the way he wants. While I don’t know what Paul and his companions experienced, I can say that I’ve seen the hand of God pushing my ministry around at times. I’ve seen it recently, and though I haven’t had any visions or heard any voices, I can see in the circumstances how God has directed my work. A few years ago some of our leaders on our Board of Outreach were looking for a way to connect with a specific mission and pursue a mission partnership. We got in contact with one of our missionaries in Eastern Asia and were working on establishing communication and finding out what we could do to support them. I was pretty eager for the project, thinking that maybe down the road this would be a way to connect with mission work in a part of the world that really interests me and also coincides with the Call I hold. But it didn’t work out. There were technical difficulties that disrupted communication. There were logistical problems that made it hard to connect with or support the missionary, or arrange meetings with him while he was on furlough. One of our board men, who was invested in the project, had health issues that got in the way of him being able to keep pursuing it. At the time I saw these as frustrations. Looking back, I suspect something larger at work. About eight months ago I had a few conversations that inspired me to start working on a foreign mission trip opportunity for my teens. I had an inkling that we’d find our best opportunity in Latin America, but I wanted to go through the process . I started by contacting our Synod’s administrator for World Missions. He pointed me to our coordinator for Latin American Missions, who pointed me to a man named Jerry who, along with a handful of others, worked to organize our mission church in Costa Maya, Mexico. Jerry and I started communicating, and his response when I talked about bringing a teen mission team down to help was enthusiastic and encouraging. He told me a little about what was new with their ministry, and it was clear that we had an open door. T his door is not open only to us. Without Synod or Mission Board support, Cruz de Cristo had been blessed by the Lord to have the people of Bloomington Lutheran supporting them financially. A few of them made a plan to go down for a few days, get to know the mission better, and help with the work. I was invited to join them. The days we spent down there showed me how much the people there need our love, our kindness, our compassion, our help, and above all, the saving message of the Gospel. The entire Yucatan peninsula is starving for the Gospel in its truth and purity. There is an enormous amount of work to be done, and the door is open. It takes a lot of courage for a teenager to travel over a thousand miles away to share the Gospel with others, to teach a stranger’s child about Jesus, and to represent Christ in an unfamiliar place. It takes a lot of courage for an adult to take a bunch of teenagers over a thousand miles away to do this work. It takes a great God to open doors and create opportunities so that young people can learn what it means to be a missionary. We sent out three teams this year. A team went to Raleigh, NC and reached out to the community door to door to open spiritual conversations and to connect a small congregation to its community. A team went to Bradenton, FL to help a tiny church run a VBS for over a hundred children (more kids than the congregation has members). A team went to Red Deer, Alberta to help run a soccer camp for the smallest congregation of the three we worked with, and helped 105 children to know that they are loved by God and others. I consider it a strength of our program that we are able to work in relationship with small congregations in the US and Canada. Foreign mission trips to third world countries are exciting and certainly cause a lot of growth, and maybe some day we will take on. But there is something special about giving a small congregation a shot in the arm. I also believe it is important to remember that there are so many people who need Jesus right here in our country and culture. Our teens see how many of their fellow citizens are hungry for the Gospel, sometimes without knowing it. I personally was able to go with two of our three teams. I’m always amazed at the growth I see in our teens as they work. I had a member say to me just a couple days ago that he can’t imagine doing the kind of work we have the teens do. Isn’t that incredible? Our teens are stepping forward to do things some adults – very involved and faithful adults – aren’t sure they could do. Our teens had face to face conversations about faith with atheists. They taught Bible stories to large groups of children. They gave some adolescent foster children their first experience hearing about Jesus. They reached out to parents and invited them to get connected to the Word. I was with one of our teens when he spent forty minutes standing in an atheist’s driveway debating the existence of God. That teen raised points and asked questions that challenged this man’s viewpoint and even elicited a slightly tongue in cheek that he would concede to being a very skeptical agnostic. Afterwards, that young man was so fired up about sharing his faith he could hardly talk straight. A young lady on one of our teams found the fellowship with her fellow teammates to be one of the best parts of the trip. We end every devotion time together in a group hug while we pray, and after saying “amen” everyone gives hugs to each other. This particular girl so looked forward to these devotions and embraces, she was constantly asking when we have devotion each day, and was sad when the trip ended. She always made sure to hug each person each time. One of our teams was made up of such a disparate group of teens, most of whom didn’t really know each other prior to the beginning of the week, that you would think there was no way they could work together. Yet, that team managed 42 hours in a van round trip, along with the whole week spent together, and bonded so deeply and had so much fun together you could not help but see the hand of God. That team was also able to experience together the wonder of God’s creation in the Canadian Rockies (and an exciting encounter with a grizzly bear). Our Florida team made a memento of their time together – handmade bracelets, which their chaperone taught them how to make. I noticed that as recently as this past Sunday some of those girls were still wearing their bracelets. I read a lot about best practices in youth ministry, and there’s plenty out there that says short term mission trips aren’t beneficial. Or that they are, but only if you go foreign. Or only if you don’t go foreign. And so on an so forth. Here’s what I know – I have seen teens growing in their faith, in maturity, in relation with each other and with me. I have seen people responding to the Gospel that our teens share. I have seen our teens come back fired up for ministry and eager to make it a full time career. God is good, and this is worth doing. There’s something I always feel bad about when I come back from a mission trip – I can rarely provide much in the way of photo evidence that we actually did any work. I usually have tons of photos of our teens out and about doing something recreational during our free time. Pictures of teens actually working? Not so much. And even when I try, they usually don’t look nearly as engaging as you’d hope. This has given rise to the assumption on the part of some (well, okay, my wife is the only one who has said it) that it seems like all we do on mission trips is go out and have fun. Well, I want to declare most definitively that we do not just have fun on mission trips! Sometimes we are most definitely not having fun! Today was our first day of working with kids in the track and field camp. There are only about 22 of them, which seems like such a small number. However, as I reflected in my previous post, that doesn’t necessarily mean it isn’t time and energy well spent. That was even more evident to me today.